“We are left with no option, as the state government has not only ignored our 35-day indefinite strike, it has also threatened to remove us instead of fulfilling our genuine demands,” said a protester. 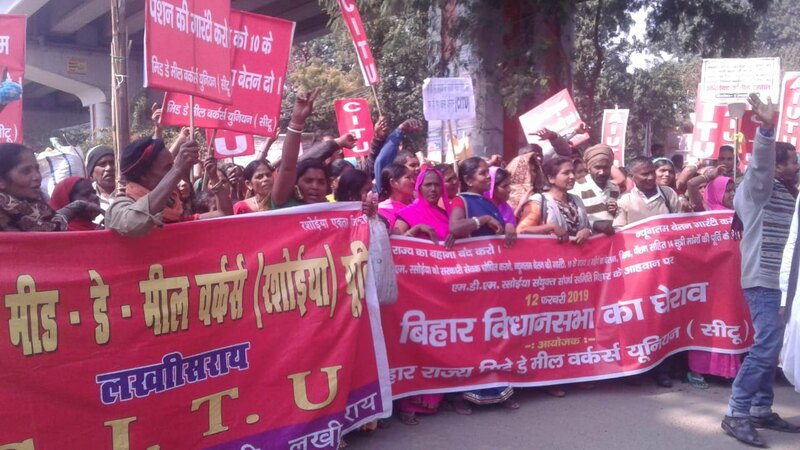 Nearly 10,000 midday meal cooks, locally known as rasoiyas, on Tuesday gheraoed Bihar assembly as a part of their ongoing protest, demanding minimum wage, labour laws and other benefits like social security. The midday meal cooks with red flags, banners and placards in their hands, raised slogans, and took to streets to gherao the state assembly, ignoring warnings of the hundreds of police deployed. These protesting midday meal cooks, mostly women clad in sarees, first assembled at Gardanibagh – a site for protests in Patna, which is hardly 500 metres away from the state assembly main gate – and later marched towards the assembly. “We are left with no option, as the state government has not only ignored our 35-day indefinite strike, it has also threatened to remove us instead of fulfilling our genuine demands,” said Sobha Devi, one of the thousands of midday meal cooks that have been protesting in the state. Bihar assembly’s budget session began on Monday, and the state government presented its annual budget on Tuesday in the house. With heavy deployment of security forces in and around the assembly buildings, protesting midday meal cooks were forcibly stopped on the way, and were asked to end their protest. However, they continued to stage protest leading to disruption of traffic for hours. “We will continue the protest tomorrow as well. The government has to fulfil our demands, we will not sit silently,” said Parvatiya Devi, a midday meal cook from neighbouring Vaishali district. CITU leader Vinod Kumar on Tuesday told Newsclick that striking midday meal cooks are ready for talks, and are awaiting a call for talks from the government. “But the government is behaving like an autocrat and not yet invited us for talks,” he said. Striking midday meal cooks leaders have repeatedly blamed the stubborn attitude of the state government for their continued protest. It has deprived more than one crore school children, mostly from poor families, of nutritious meals. It has resulted in lowering of attendance in the government-run schools. In a circular issued to all the district education officers on January 29, Binod Kumar Singh, special secretary, Department of Education, and director of Midday Meal Bihar, had said that payments to the cooks should not be made for the duration of strike, and if they fail to immediately join work, should be removed, and alternative arrangement should be made.